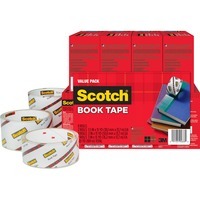 Super clear, thick, pressure sensitive tape repairs, reinforces, protects and covers bound edges. It can be marked on with most permanent ink and can also be used for hinging or laminating. The adhesive is long aging and nonyellowing. This eight roll value pack includes two 1 12 rolls, four 2 rolls and two 3 x 15 yard rolls.